At the North American Auto Show, Kia unveiled two of its Forte lineup models; the Forte5 2017 and Kia Forte 2017. The model is housed with updated engine and a new trim with some semi-autonomous technologies. 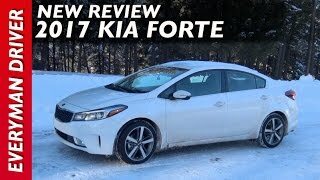 Let us have a descriptive look at the review of Kia Forte 2017 to know in detail about it. 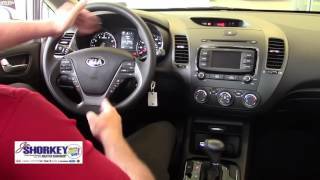 The interior of Kia Forte 2017 is very much similar to its 2016 sibling. First thing to notice inside the leather wrapped steering wheel mounted over the neatly designed dashboard. The LX and S trim levels come with seats wrapped in upgraded cloth while the S trim has the special essence through the black cloth wrapped seats with contrast stitching in white. Seats come with heating function and with 10-way electrically adjustable system. The EX trim is loaded with dual-position memory settings, dual-zone automatic HVAC controls, rear passenger vents and push button start with Smart Key. Talking about the standard features in S and EX trims, the buyers will get UVO 33 telematics, the newly designed company infotainment system. The tech is featured through the seven-inch touchscreen and it supports connection through Android Auto and Apple CarPlay. 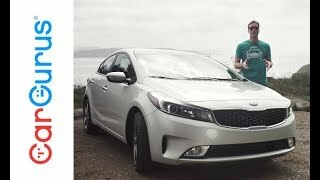 Thus rounding up the interior details of Kia Forte 2017 I would say, the primary focus has been executed commendably and the buyers will have a treat with these new features. 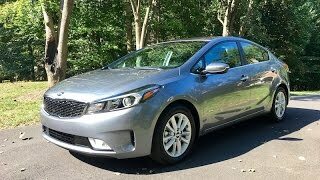 The exterior of Kia Forte 2017 is the place where you might notice minor changes. The first one that came across me was the extended ‘tiger-nose’ grille, which now touches the newly designed set of headlights. Beneath the setup you have pair of fog lights sitting close to the air vent and giving the front end the touch of aggression. The rear portion of the model has more pronounced lip for the trunk lid. The new set up of tail lights now feature dual-layer look and make the rear fascia look more appealing. Beneath buyers will get chrome exhaust tip while the same gets complemented by the spoiler mounted over the trunk. In all rumbling over the 16” wheels, exterior of Kia Forte 2017 looks luxurious and elegant. Though the performance figures of Kia Forte 2017 are still not shared but we do know that beneath the hood will be two engine options. The LX and S trim level will come with an all new 2.0 liter four-cylinder engine mating to six speed manual transmission as standard. However the buyers will get the option of upgraded six-speed automatic transmission. The second engine beneath the hood of Kia Forte 2017 is with the EX trim level and it’s the ‘tried and tested’ 2.0 liter GDI four banger engine paired to six-speed automatic transmission as standard. 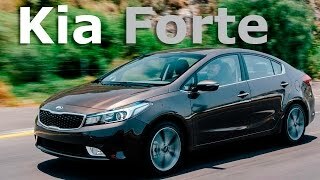 We expect to have the power output figures of Kia Forte somewhere in 2017, close to its production release.